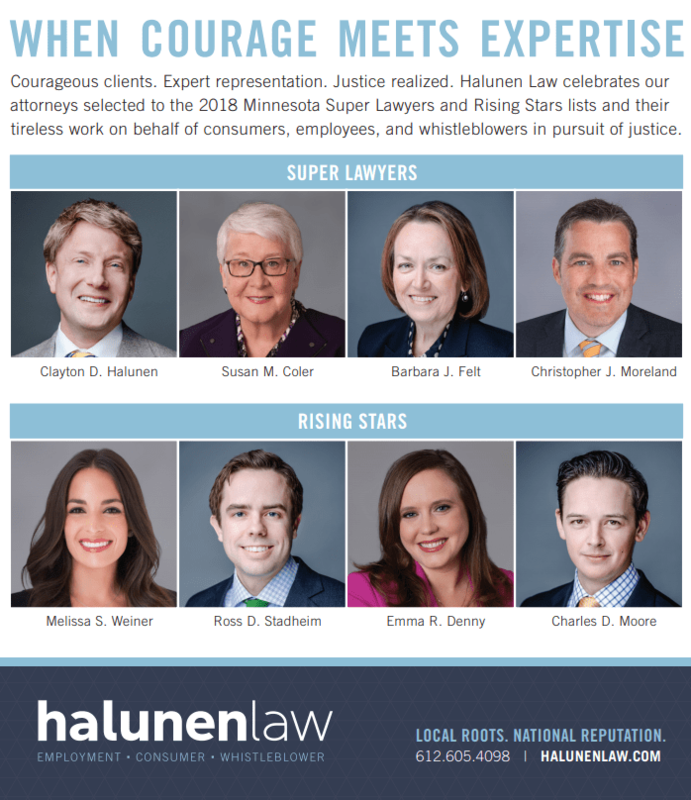 Minneapolis, MN: For the 15th consecutive year, Halunen Law founder and managing partner, Clayton Halunen was selected to the Minnesota Super Lawyers list. Halunen Law partner, and chair of the False Claims Act/Whistleblower practice group, Susan Coler was selected for the 10th consecutive year, while employment attorney Barbara Felt was included for the 5th year in a row. Partner and Consumer Class Action attorney Christopher Moreland was newly selected to the Super Lawyers list. Returning to the Rising Stars list was partner and employment attorney Ross Stadheim, employment attorney Emma Denny, and consumer class action attorney Charles Moore. The Super Lawyers list represents just 5% of Minnesota attorneys, and the Rising Stars list recognizes only 2.5% of attorneys 40 years old or younger or in practice for ten years or less. ABOUT HALUNEN LAW: Halunen Law offers expertise in litigating employment cases on behalf of individual employees, consumer class actions and whistleblower cases under the False Claims Act and other statutes. With offices in Minneapolis and Chicago, Halunen Law has achieved a reputation as a fearless, tenacious and successful plaintiffs’ law firm, with a laser focus on achieving justice for its clients while creating meaningful social change.